There are a few events on the circuit that you feel a sense of accomplishment just by showing up. The Worlds and Nationals have that feeling, and for most so does Balloon Fiesta. It's the biggest most popular balloon event in the world and it is difficult to talk to anyone about ballooning without fielding questions about that big event out west. Whether its your first time or you fly it every year when you arrive in the shadow of the Sandia's you feel like you've made it. Perfect weather greeted pilots all week. Morning Mass Ascensions and evening glows in front of huge crowds kick off the event on the first weekend. Competition runs Monday - Friday with competitors flying into Balloon Fiesta Park. Monday was a Multiple Judge Declared Goal with three target options on the main field. Albuquerque's shifty winds held relatively consistent leading to many close scores. Tuesday competition was the Sid Cutter Memorial Task. Pilots had to get their baggie in one of four scoring areas on the field including a boat named after Sid. Possibly the best steering winds all week helped 12 pilots get their baggie in the little boat (the best possible score). Wednesday was a mass ascension from the field with targets just to the south, but scores were not included in the overall results. Thursday was the only day flying events were cancelled. 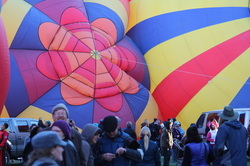 High upper winds kept balloons on the ground, but the special shapes were able to inflate for the crowds. In the afternoon winds increased to around 50mph with rain. By Friday the rain and wind had moved out and left extremely calm winds for the final competition flight. A minimum distance double drop was the task of the day. The slow winds made for long flights into the field for competitors. Most pilots set up to come in just south of the target and settle into a low northerly flow right on the surface. However just as the main pack arrived the northern wind quit and left pilots stranded south of the targets. One pilot played it right, got there early, and was one of only two pilots to score. Daniel Liberti scored Friday and became the only pilot with three scores - winning the 2013 Balloon Fiesta! Daniel beat hundreds of other balloons to claim the $10,000 prize. Congrats Daniel!